This Kichler Lyndon 1 light small hanging outdoor porch lantern in architectural bronze finish with clear seeded glass shade is rated IP23 and features updated traditional period style. Boasting a circular ceiling cup, chain suspension and small downward facing lantern, with sloping roof, detailed shade mount and flared clear seeded glass shade containing a bare lamp bulb. If you are searching for quality lighting in a traditional style, this small outdoor chain lantern should be considered. Fully weatherproof and supplied with a manufacturer’s 3-year anti corrosion warranty, which relates to the corrosion of finishes on exterior lights like this one. Locations within 5 miles of the coast are excluded. Exterior fittings must have an IP (Ingress Protection) rating which indicates the fittings ability to prevent solids and liquids penetrating the enclosure. The higher the number, the greater the protection. The minimum rating for an outside light exposed to the weather is IP23. 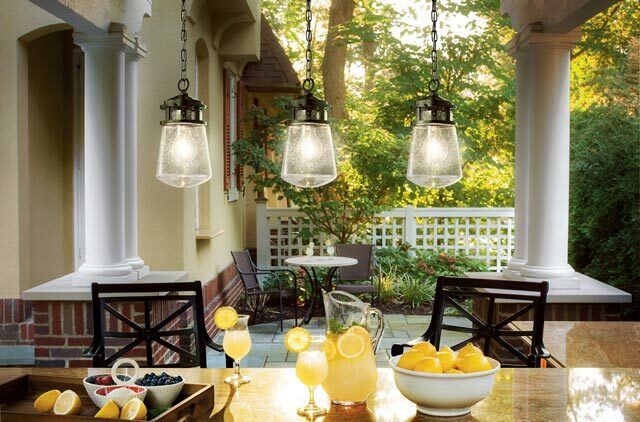 This outdoor porch chain lantern is rated IP23. There are matching fittings in the Lyndon outdoor range that includes medium and small wall lanterns and five light outdoor chandelier; please see below for the complete collection. Supplied with 100cm of height adjustable chain suspension, please see the technical information for minimum and maximum drops. This exterior light is supplied by Elstead Lighting and designed in the USA by Kichler who were founded in 1938. They design beautiful home lighting products featuring award-winning craftsmanship and unparalleled quality, such as the Lyndon 1 light small hanging outdoor porch lantern in architectural bronze finish with clear seeded glass shade you see here. This product is rated at IP23. Depending on the bathroom zone it is installed, it may need to be IP44. Please check with your electrician to clarify this if in doubt. Hi can you tell me the minimum total height including shade, chain & ceiling rose, at shortest possible length. The shortest possible distance between the ceiling and the bottom of the lantern when installed is 294mm.